Founded in 1919 as a subject board at Zhytomyr Public Education Institute, the Zoology department became a structural part of Social Education Institute in 1929. Professor E. Bruhher was the first Head of the department. In 1922 Full Professor, Doctor of Letters P. Kharchenko fostered the establishing of Zoology, Physiology, Anatomy and Microbiology laboratories. Being not functional in the years 1938 to 1962, the department resumed its activity only in 1962 as a subject board of the School of Nature Studies at Berdychiv Pedagogical Institute, becoming a Zoology Department in 1965. Associate Professor, PhD in Medical Sciences N. Pastuh became the Head of the department. The department staff included: Associate Professors A. Danyliuk, I. Kokoshkin, instructors H. Bohinich and L. Yanchuk. In 1965 L. Kurkchi and K. Kopein joined the staff and V. Horoschenko was employed in 1969. The Department had three research laboratories under its supervision, namely, for training in Zoology, Anatomy, Human and Animal Physiology. 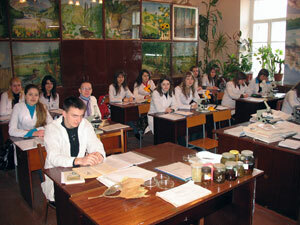 In 1971 the Zoology department became a part of Zhytomyr Teacher Training Institute. Two lecture halls and six specialized laboratories for Invertebrate Zoology, Vertebrate Zoology, Human and Animal Physiology, Human Anatomy, Histology and Microbiology were equipped for the department. The formation of the department staff continued, with A. Stadnychenko being employed as an Associate Professor, and in 1973 becoming the head of the department. 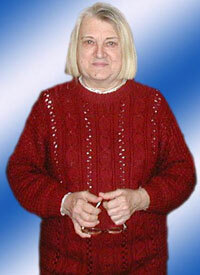 Professor I. Utkina worked at the Department from 1975 to 1978, Associate Professor V. Kushnir was the member of the Department from 1980 to 1984, Associate Professor M. Slastenko worked from 1985 to 2000. 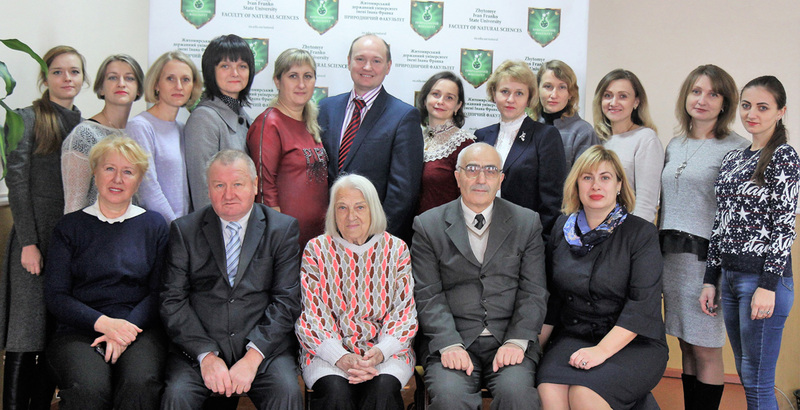 Now the department has a staff of twenty two: Full Professor A. Stadnychenko, Associate Professors E. Truckavetskiy (laureate of the “Labor Valor” medal), A. Vyskushenko (Honored Educator of Ukraine), D. Vyskushenko, L. Yanovich, Associate Professors R. Melnychenko, T. Yermoshyna, V. Tanska, PhDs O. Pavliuchenko, R. Vlasenko, S. Shevchuk, Assistant Professor V. Hyryn (Honored Educator of Ukraine), instructors L. Ivanenko, J. Tarasova, O. Korshunova. 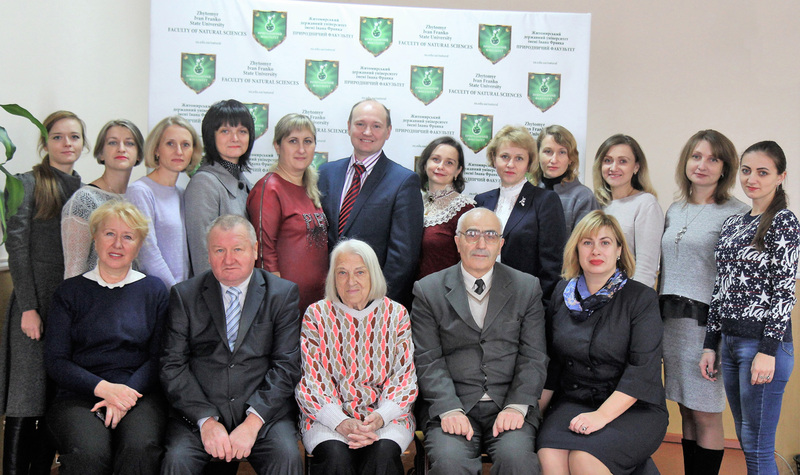 V. Monchenko, a Member of National Academy of Sciences of Ukraine, I. Akimov, Corresponding Member of the National Academy of Sciences of Ukraine and Full Professor, Doctor of Letters (Biology) S. Mezhzherin are also on the department staff. The department provides training in various subjects, namely: zoology, histology, cytology, microbiology, anatomy, human and animal physiology, developmental physiology and school hygiene, bases of socioecology, theory of evolution, and different types of research and field practical courses. The main areas of scientific research conducted by the Department are biodiversity, current condition and further development of Ukraine’s wildlife under anthropopressing conditions. The Scientific School for Malacology has been functioning at the Department for more than 30 years and involves scholars, instructors, postgraduate and graduate students. 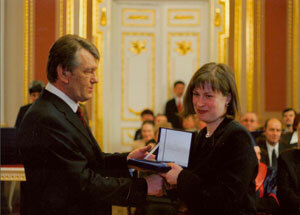 The main achievements of the School are presented in more than 1000 research papers published in Ukraine and abroad. From 1996 to 2005 three state budget projects have been successfully carried out. In 2002, 2004, 2006, 2012 the Department conducted International scientific malacological conferences “Mollusks. The Main Results, Problems and Prospects of Research”. The faculty (A. Stadnychenko, T. Yermoshina, O. Pavlyuchenko) are authors of 8 monographs. The Department actively encourages students to carry out research on ecology and environmental issues. Students work in research groups headed by experienced instructors and scholars. Under the guidance of Prof. A. P. Stadnychenko, Associate Prof. L. M. Yanovich, Associate Prof. R. K. Melnichenko, Associate Prof. T. V. Yermoshina, Associate Prof. O. V. Pavlyuchenko students investigate the impact of various anthropogenic factors such as pesticides, molluscicides, fertilizers, detergents, ions of heavy metals, phenols, etc. on behavior, physiological and biochemical parameters of freshwater mollusks homeostasis. Student research papers are done in the framework of Department research topic, coordinated by the international research center “UNESCO-MBM”. Professor A. P. Stadnychenko, Associate Professor R. K. Melnichenko, Associate Professor L. M. Yanovich direct and supervise the activity of the student research group for vertebrate zoology, studying vertebrate fauna, ecology and biomechanics of the musculoskeletal system. Students report results of the conducted research in course and diploma papers as well as in presentations at various scientific conferences and nationwide competitions for the best research paper on Natural Sciences. Student research papers are annually published in scientific journals (“The Zoology Bulletin”, “Parasitology”, “High School Scientific Reports. Biological Sciences”, “Hydrobiological Journal”. “Bulletin of Lviv University”, “Scientific Bulletin of Ternopil University”, “Bulletin of Uzhgorod University”, “Bulletin of Lugansk University”, “Bulletin of ZHNAEU”). Research students participated in various scientific conferences, including the All-Union Society of Helminthologists /Moscow, Sumy/, and Ukrainian Scientific Society of Parasitologists /Lviv, Odesa, Kyiv/, the All-Union Conference on Animal Behavior Study /Moscow/, the All-Union Symposium on Parasites and Aquatic Invertebrates Diseases Study /Vilnius, Leningrad, Kyiv/, as well as in the All-Union Scientific Student Conferences /Moscow/ and University Scientific Student Conferences /Kazan University, Smolensk Pedagogical Institute, Zaporizhia Pedagogical Institute, Ternopil Pedagogical Institute, Tiraspol Pedagogical Institute/. Ten student research papers have been awarded the diplomas and letters of acknowledgment at the Ukrainian and All-Union competitions. Students’ publications raise interest abroad, as evidenced by requests from 34 countries to send copies of their papers. Three students received a personal invitation to take part in the International conference in Belgium, two students were invited to the USA, and four students went to Morocco. Students of the Natural Faculty won the Nationwide Competitions on Zoology (T. Besedivska, A. Kateryneko, T. Yarmolenko, M. Minyuk, A. Kohanska) and Competitions on Ecology (O. Anichkin, A. Kohanska). Pupils Taran K. and Kirichuk V. were awarded the Bronze medal and the Silver medal at International Ecology Competitions in Antalya (2001) and Istanbul (2009). In 2010 and 2012 Yanovich O., the 9th grade pupil, won the second prize for the scientific research at the Ukrainian competition. 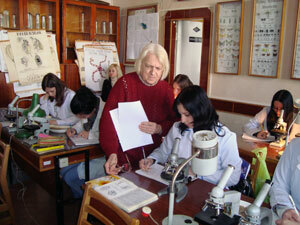 In 1992 the postgraduate program “Zoology” was launched at the Department. Under the guidance of Prof. A. P. Stadnychenko, Assistant Professor O. V. Harbar, Assistant Professor L. M. Yanovich postgraduate students are engaged in research on malakofauna of Ukrainian Woodlands, endoecology and genetic issues. 26 graduates have successfully completed the postgraduate program and defended the dissertations during the period 1992-2011. Three postgraduate students (G. Kirichuk, L. Yanovych, V. Gradovsky) have received grants from International Fund “Renaissance” in science and education, and their supervisor Professor A. Stadnychenko twice received this grant. Four postgraduate students (L. Yanovich, G. Kirichuk, R. Melnichenko, O. Garbar) have won the State Prize of the President of Ukraine for young scientists. Two postgraduate students (O. Uvayeva, O. Pavlyuchenko) are laureates of the National Academy of Sciences Award for young scientists, Uvayeva O. and Pavlyuchenko O. are laureates of the Cabinet of Ministers Award. Four postgraduates (Yanovich L., Kirichuk G., Vyskushsnko D., Uvayeva O.) have become scholarship holders of the Cabinet of Ministers of Ukraine. With the efforts of the Department the Museum of Nature was set up at the Natural Geographic Faculty. 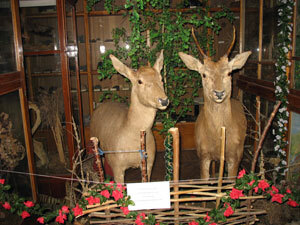 The Museum collection contains specimens of Ukraine and world fauna, plants, reliquiae and minerals. The Department faculty have developed all course materials according to the requirements of credit-module system. 7 textbooks and 5 manuals have been published, namely “Cytology” (Truskavetskyi E., 2002), “Histology and Basics of Embryology” (Truskavetskyi E., Melnichenko R., 2003), “Biology. Grade 7” (Mezhzherin S. V., Mezhzherina Y. O., 2003, 2008), “Rare and Endangered Species of Zhytomirshchyna” (Stadnychenko A., 2003), “Laboratory Course on Human and Animal Physiology Guidelines” (Pavlyuchenko O., Uvayeva O. I. 2010), “Vertebrate Zoology” (Vlasenko R. P.).